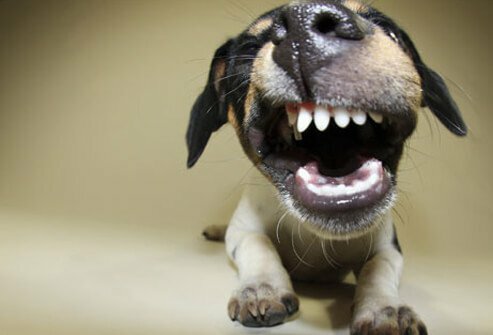 Think dogs' mouths are cleaner than humans? Think again. Dogs' chops are teeming with bacteria, and may harbor germs like salmonella and campylobacter. These organisms get into a dog's mouth from eating spoiled food or when he uses his tongue as toilet paper. 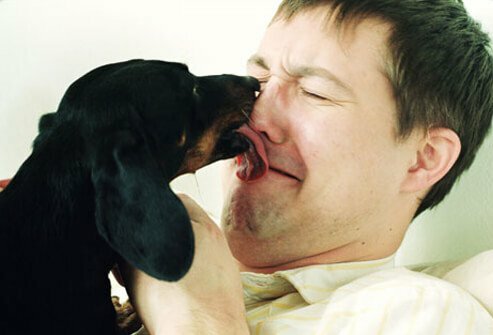 Then a kiss moves these germs from pooch to person, potentially along with a nasty case of diarrhea. It's not common, but it happens. H1N1 "swine" flu has hit cats, dogs, and ferrets -- contracted from their sick owners. Most often it's mild, but a few pets have died, so vets advise frequent hand washing and separate beds when the owner is sick. 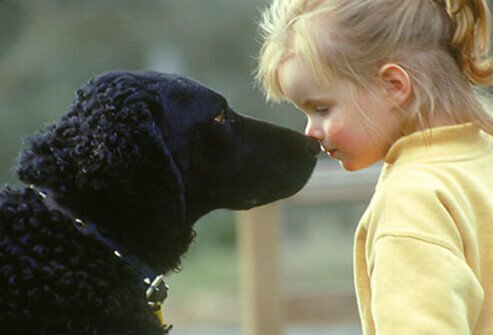 Dogs and people can also share the same strains of E. coli bacteria. And MRSA, the "superbug", can move between humans and dogs. This superstition goes back to the 1700s. 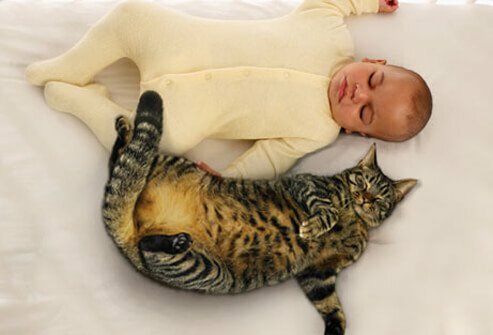 When babies died of sudden infant death syndrome (SIDS), people were quick to blame a cat seen lying in the crib. Today, soft toys, illnesses, a stomach-lying position have all been linked to SIDS — but not cats. Cats are drawn to cribs because they're warm, cozy, elevated places – perfect for a catnap. It sounds like a Lassie TV episode, but it's truth, not fiction. 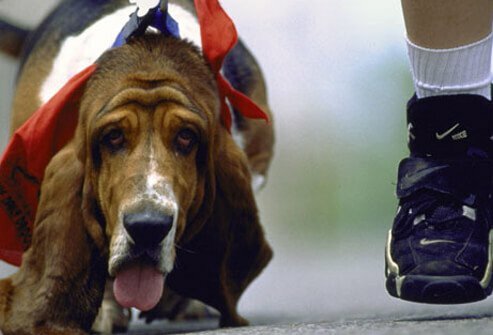 Dogs can sniff out a dangerous drop in blood sugar in a diabetic owner and alert the person to take action by pawing, licking, whining, or barking. A few dogs have even been trained and placed as diabetic service dogs. Their nose for hypoglycemia (low blood sugar) is correct 90% of the time, according to their trainers. Behavior experts confirm that some cats really do experience separation anxiety when apart from a favorite person — and that's one reason a sweet kitty may pee on your clothes when you're at work. Other signs: the cat paces, vocalizes, or blocks the owner's path to the door. Left alone, she may vomit or be too worried to eat. For cats who love too much, behavior therapy can help -- along with anti-anxiety medications for severely affected cats. Top Dog: Border collie, poodle, German shepherd, golden retriever, Doberman pincher. Cats with a white coat are often deaf in one or both ears, especially those with blue eyes. 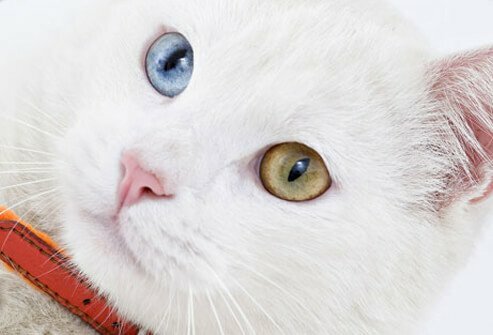 When only one eye is blue, the cat is likely to be deaf on that side only. 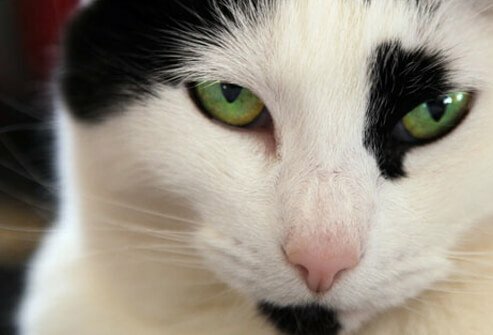 Many owners report that deaf cats are not too bright — but it's not clear if deafness or lower intelligence is to blame. Cats are champs at landing feet first over short distances, thanks to a highly flexible backbone. But they do sometimes land on their heads. And beyond one-two stories, their feet cannot "break" the fall. Their heads and bodies collide with the ground, causing severe injuries. 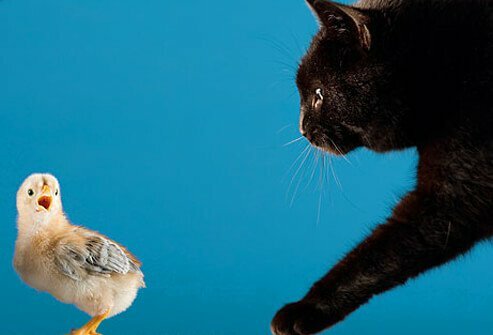 Cats with access to an elevated, open window may also focus so intently on a bird, that they lose their balance and fall — called high-rise syndrome. Dog lovers have created a competitive event called canine freestyle that brings the bond between human and animal to a new high. A dog and handler pair up — ballroom dancing style — for a choreographed dance performed with music and, sometimes, matching costumes. Cats have a small scent gland in the roof of the mouth called the vomeronasal organ. 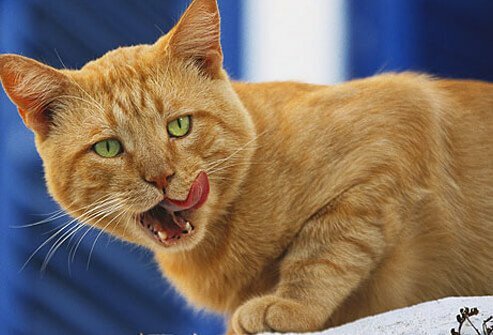 For a really good whiff of something like urine or another cat's private parts, they'll open their mouths wide to draw the odor to this scent organ. This fierce-looking behavior is called the Flehmen reaction, and it's often seen in males who are checking out a female cat in heat. A dog wags his tail in three very different moods and only one is happy. When it's unusually high and stiff, the dog is agitated and ready to protect his turf. A tail held low and wagged very quickly shows a scared and submissive dog. 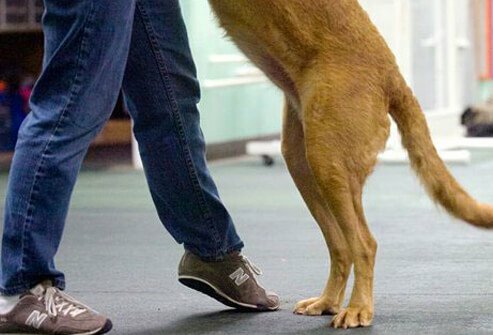 A happy dog wags his tail in its natural, mid-level position — and his ears, mouth, and body will look relaxed, too. 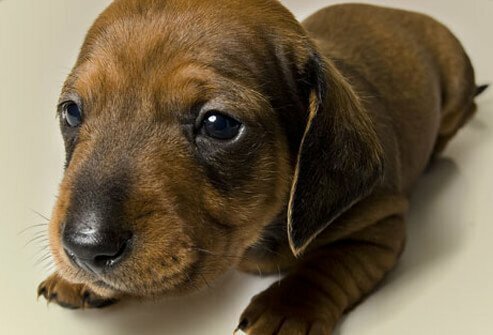 Puppies don't wag their tails before they are about three weeks old — and some don't start until seven weeks old. Vets believe tiny puppies are capable, but they're too busy sleeping and eating to bother. 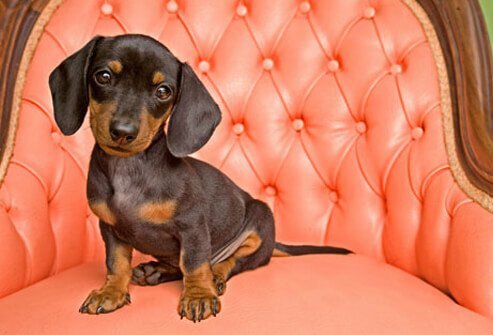 As they become more alert, tail wagging starts as a kind of sign language: a peace sign to rambunctious littermates or when begging for food. Dogs almost never wag their tails when alone. Cats that are aloof or bite the hand that feeds them probably had no exposure to people in early life. Feline behavior experts say a kitten needs regular contact with people in the first seven weeks, or it may never bond with humans. Even five minutes a day in the early weeks will teach a kitten not to bite when the hand of a towering human lifts it off the ground. Not so, say canine researchers. Dogs see blue, violet, and many more shades of gray than humans. They also see better in low light and can pick up the slightest movement — a trait that makes them good hunters. They probably do not see red, orange, yellow, or green, based on examination of the color-sensitive cone cells in canine retinas. 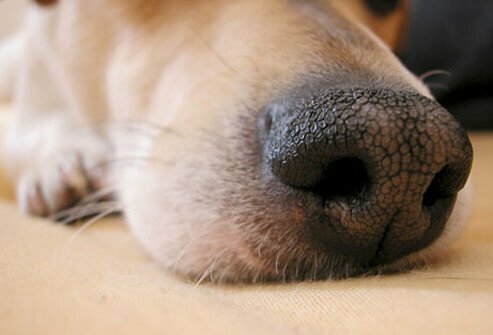 The temperature of a dog's nose changes easily and is not a good sign of illness. It can be hot and dry after lying in the sun or cool and wet from dipping into the water bowl. Better signs of illness are lethargy, loss of appetite, vomiting, coughing, or a body temperature above 102.5˚F on a rectal thermometer. The wet snout? It comes from ducts that carry tears toward the nose. Dogs sometimes come to the vet for a limp and leave with a diagnosis of lung cancer. Cancer in the chest can activate the leg bones to grow new tissue -- causing swelling and pain in the legs. A more typical symptom of lung cancer is a cough, although about 25% of dogs have no symptoms until cancer is detected on chest X-ray. The leg changes -- called hypertrophic osteopathy -- go away once the cancer is treated. 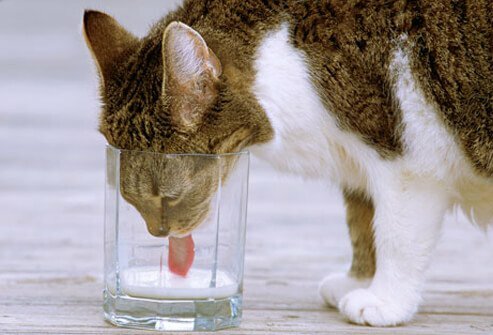 The long-standing myth that cats need milk is wrong and giving your pet a saucer of cow's milk could make it have diarrhea. 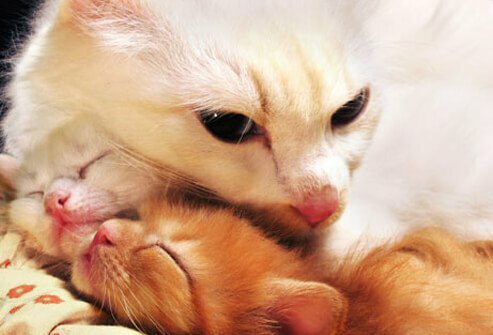 Kittens drink their mother's milk until they are weaned and older cats may like the taste of cow's milk. But adult cats don't have much lactase, the enzyme needed to break down the lactose sugar in milk. The result is often uncomfortable and messy: diarrhea. This practice comes from the idea that ancient dogs (wolves) ate plenty of bones. Today, pet dogs can get all the calcium and nutrients they need from dry kibble. 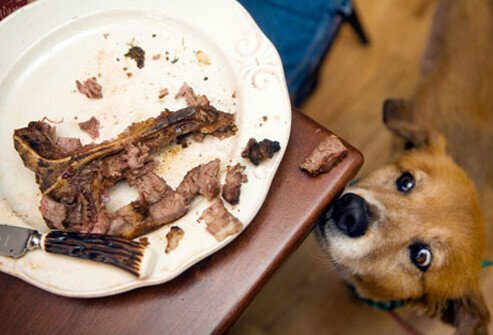 Bones do satisfy the intense canine chewing instinct, but they can choke a dog or splinter into knife-like shards, even when cooked. Edible chewies or sturdy rubber chew toys from the store are a safer choice. There is no magic healing power in dog saliva, contrary to popular belief. Quite the opposite: mouth bacteria may cause infection that delays healing. Dogs are also prone to compulsive licking, which can result in persistent sores, called acral lick dermatitis. The healing choice is usually an Elizabethan collar that blocks his tongue from reaching a sore until it's completely healed. Cats communicate with a slow blink, according to feline experts. With their own kind, it's a peace sign, meant to put other felines at ease. Aimed at a human, this seductive blink shows affection, even love. People can return the love with a long gaze and slow blink to "blow a kiss" back in cat body language. The calming blink works on house cats, feral cats, and even tigers in the wild, according to behaviorist Roger Tabor. 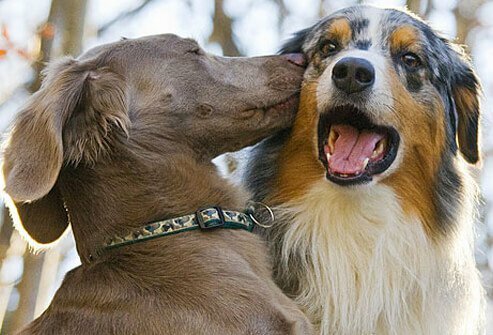 Can two dogs develop a loving relationship? Or do they hook up with anyone at the dog park? 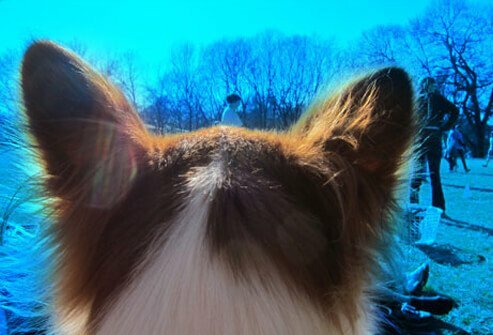 Anthropologist Elizabeth Marshall Thomas says dogs can fall in love and she documents a remarkable love story between "Sundog" and "Bean" in her book, "The Social Lives of Dogs." Thomas claims few dogs develop relationships because they are kept as pets in captivity, "born to do what we want, not what they want." Secondhand smoke increases the risk of at least two fatal cancers in cats: lymphoma and oral carcinoma. Housecats get a double dose of toxins by breathing cigarette smoke in the air and by licking the residue off their fur when grooming. Dogs with long noses may develop cancerous nasal tumors from living with a smoker -- and short-nosed breeds are more prone to lung cancer. The quiet, motor-like sound of a purring cat is not yet well understood. 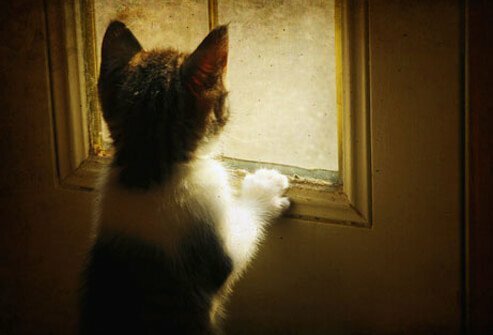 Every cat fancier has seen their pet purring in happiness; yet cats also purr when they are in pain or close to death. It may be a self-soothing behavior. 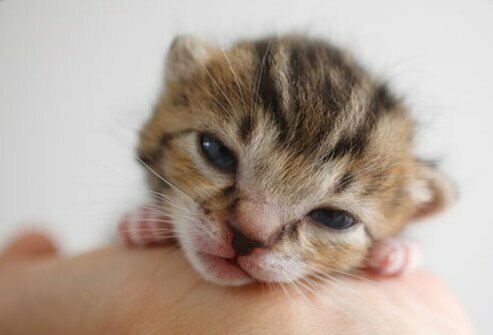 Kittens begin purring within hours of birth as they nurse — and the mother cat purrs during feeding sessions, too. Cats make this sharp, high-pitched sound when highly aroused by the sight of prey, such as the animal more commonly known for chirping, the bird. When a cat is blocked from getting at the prey, he may chatter — a throaty vocalization accompanied by quick movements of the lower jaw. Owners who insist their dogs can smile are correct in thinking that the canine mouth can show emotions. Relaxed and open, it can be a sign of a happy dog. A submissive grin is a canine version of our nervous smile. Dogs pull their lips up, show their front teeth, and may crouch. This harmless, nervous "grin" is easily confused with an aggressive snarl. When in doubt, don't mess with the dog. When a dog turns his head away, but swivels his eyes around to keep you in sight, he is displaying "whale eye," and is usually frightened or guarding something. The whites of his eyes will show in a crescent shape and disturbing him can lead to growling or snapping. A stiff body completes the tense picture. Dogs have a sideways glance for more relaxed moments, too: not much white will show and his body will look at ease. 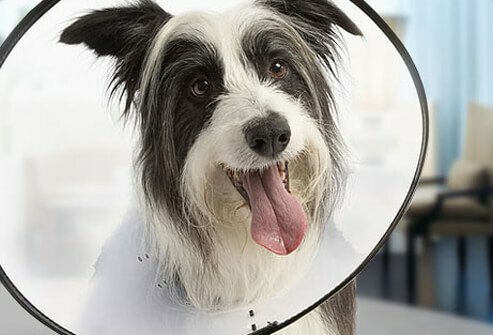 American Diabetes Association: "Could a Dog Save Your Life?" 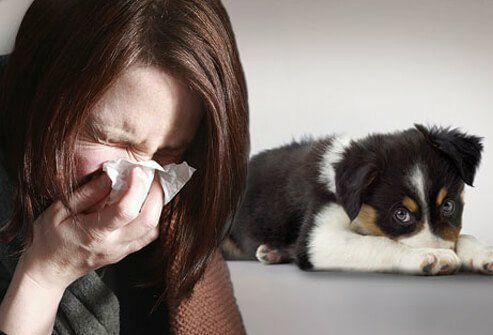 American Veterinary Medical Association: "Frequently Asked Questions about the 2009 H1N1 Flu Virus and Pets." 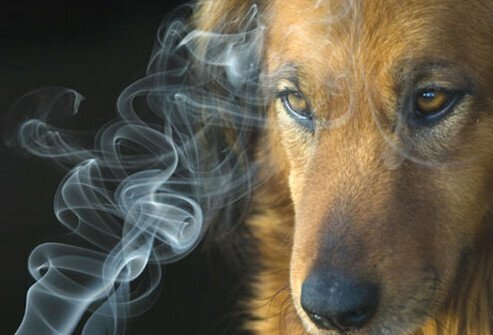 Feeding Your Pets," "Secondhand Smoke: Silent Killer Hurst Pets, Too." Brevitz, B. Complete Health Dog Handbook, Workman Publishing, 2009. Byard, R. Sudden Death in Infancy, Childhood and Adolescence, Cambridge University Press, 2004. Canine Freestyle Federation: "Canine Freestyle." Cat Fanciers' Association: "Myths and Facts About Cats." Cats International: "Your Cat's Tail, Ear, and Eye Signals." Coile, C. Why Do Dogs Like Balls? Sterling, 2008. Coren, S. How to Speak Dog, Free Press, April, 2000. 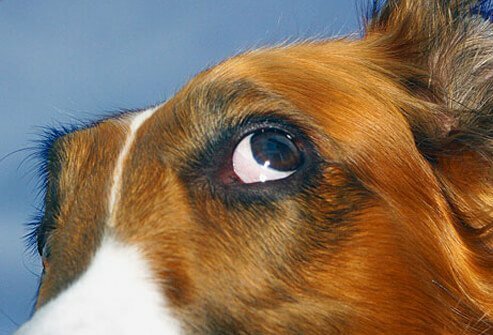 DOE Office of Science, Ask a Scientist: "Cat Eye Blinking," "Dogs and Wet Noses." Marshall Thomas, E. The Social Lives of Dogs, Simon & Shuster, 2001. 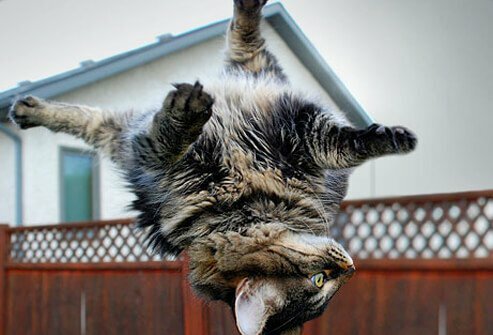 PetEducation.com: "Do Cats Always Land on Their Feet?" "High-Rise Syndrome: Cats Injured Due to Falls," "Petting-related Aggression in Cats," "Separation Anxiety in Cats," "Flehming: Smelling with an Open Mouth." Petplace.com: "Can Dogs See in Color," "The Risks of Secondhand Smoke in Cats," "Understanding 'Cat Talk' What Is Your Kitty Saying?" 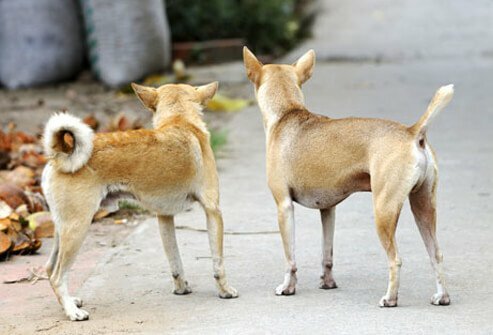 Pets.ca: "Dog Tails - Why Dogs Wag Their Tails." Tabor, R. Cat Behavior, a Complete Guide to Understanding How Your Cat Works, Readers Digest, 1998.